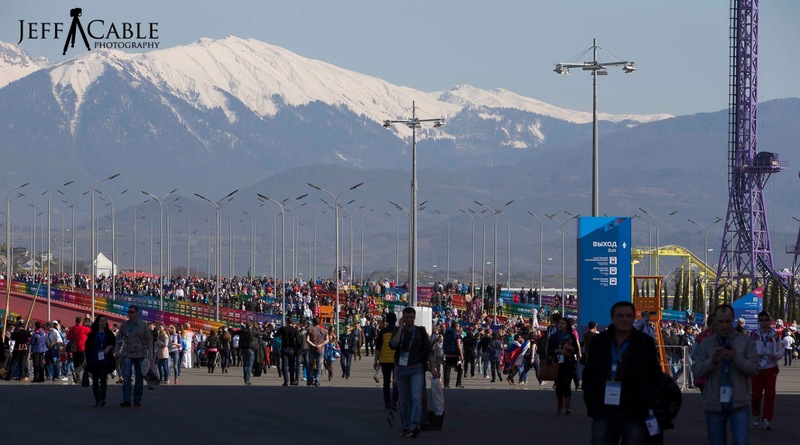 Jeff Cable's Blog: Would you like to know a typical day photographing the Winter Olympics? Would you like to know a typical day photographing the Winter Olympics? I already told you how I do my workflow in a previous blog, but now I want to tell you about a typical schedule for a day photographing the Olympic Games. This will also help you understand why it is so difficult to cover more than one event per day. 8:40pm: I actually left the clean zone (finally!) to get a real dinner. I am sick of McDonalds!! 11:45pm: They arrange for a second bus. Bonus! 1:30am: We get back to the MPC and I wait for the next bus to take me back to my "hotel"
3:00am Night night time - so much for trying to make it an early night. And here I write this while eating another dinner at the press center. No time wasted! Still gotta love it all! Wow.. Amazing.. No breakfast? And how can you blog at your venue??? Is there a place with internet while you are vying for position on the ski slope??? You also forgot to mention when you have time to go to the bathroom.. or is it true all the journalists are wearing DEPENDS? The starry sky image had me going for a minute until I read your caption...super cool effect! Probably worth experimenting with this concept on future shoots. Rock on Jeff. Keep up the great work, the world is totally digging your photos. Thanks for the posts,loving every one. They really add to the Olympic coverage. What a schedule. Please know your efforts are being completely enjoyed back home..well at least at my household in San Francisco. Thank you for your great content! Nice to have so many things to do. Better more than less. Enjoying your blog and photos. Loving your posts and photos!! Watching event on tv, then catching up with your blog. Almost feel like I'm there! Thanks, Jeff!! I am having the best time reading all of your blogs. After reading the ones I see posted on Facebook I go directly to my email to search for your blog email to see if I have missed anything. LOVE LOVE LOVE what you are doing for all of us. Thank you! That is an exhausting schedule. Thank you and we appreciate your taking time to blog your wonderful pictures and give us the behind the scene scoop. What an experience though, not something many people get to experience. Thanks again and I look forward to attending more of your classes.